Although the majority of circular saw blades are designed for cutting wood and engineered wood products, they are also used for cutting a wide variety of other materials, such as non-ferrous metals, ferrous metals, plastics, tile, concrete, brick and glass. Cutting requires different saw blades from those used for wood. Each of these types of materials has their own special needs, requiring special blade design. Non-ferrous metal blades are suitable for plastics too, tooth shape is TCG and the hook angle is negative. Abrasive saw blades cut materials like concrete, masonry, brick, tile; the blade is toothless or has just several teeth covered with diamond grains for prolonged durability. Glass and fiberglass cutting blades have characteristics like the previous two types. The similarity common to all mentioned saw blades is negative hook teeth, higher cutting speed (RPM) at which they operate, TCG tooth design in case the circular blade isn’t toothless. When we refer to “non-ferrous metals”, we are generally referring to metals which do not contain iron. The metals which are normally considered when referring to non-ferrous are: aluminum, brass and copper (ABC). These are all soft metals, which can be cut with circular saw blades. However, being soft, they can cause their own problems. Non-ferrous metal saw blades can cut bronze and plastics next to ABC metals. 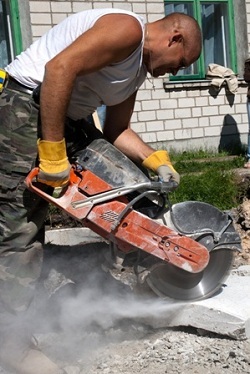 Hard non-ferrous metals, such as uranium and plutonium cannot be cut with circular saws and should not be used in a home workshop. Because the ABC group of metals is soft, it tends to stick to saw teeth; specifically to the face of the teeth. To counter this, large gullets are needed and “chip breakers.” A chip breaker is an irregularity or ridge part of the way down the face of the tooth, which would cause the material being cut off to bend suddenly, snapping off the chip. These materials tend to “pull” the blade into the material, causing cuts that are too fast and possibly binding up the saw. To counter this, a negative hook angle of about 6 degrees is used, meaning each tooth is directed backwards. It gives much better control over the cut metal. Teeth design is TCG, which is great for tough metals and alloys since the cornerless shape dulls harder than regular shapes. Heat generation is a major issue when cutting non-ferrous metals; therefore, blades almost always have expansion slots cut into them, to help with cooling and reduce the possibility of blade warping. Saw blade leaves clean edges on material, spins cool and transmits zero heat to the metal you are working with. Due to the design of non-ferrous metal saw blades, they are also excellent for use with plastics. However, you should never attempt to use them with ferrous metals (steel and iron) as these harder metals can chip teeth and even break them off, creating a safety hazard. It is strictly forbidden to use plastics or non-ferrous circular saw blade for ferrous metals! Do not experiment with this instead of getting a new blade; remember that safety is always at the first place. 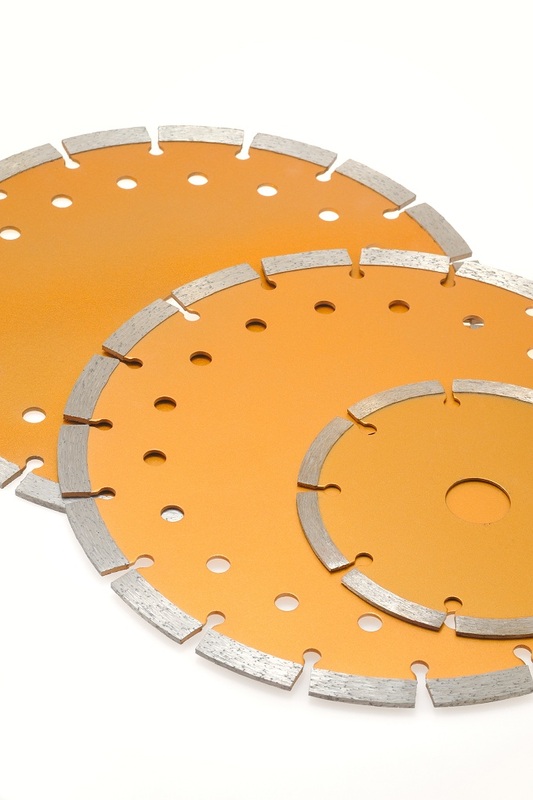 Ferrous metals are cut with a special type of abrasive blade. Ferrous metals are cut with abrasive blades. These more closely resemble a thin grinder disk, rather than a saw blade. They are made of a high speed steel blade plate, with no teeth, gullets or expansion slots cut into them. The outer edge of the blade is coated with polycrystalline diamond chips (PCD) a manufactured diamond product. This produces a highly durable blade, which can grind through ferrous metals. It can last about 100-times longer than HSS steel saw blade or 60-times longer than TCT carbide blades. When cutting with any abrasive blades, cutting speed is important. Applying too much pressure to the cut can break the epoxy bond which is holding the abrasive material to the blade plate, cause the abrasive material to be knocked off the blade. 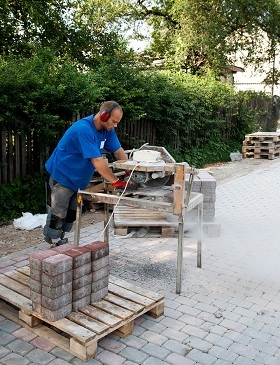 Heat is another major factor, as the abrasive action generates large quantities of heat. It is important to allow the blade an opportunity to cool between cuts. While ferrous metals can be cut on radial arm and miter saws, most people who cut these materials use a specialty “chop saw” which is similar to a miter saw, but has a clamp to hold the material being cut in place. As the metal which is being cut gets hot in the process, you don’t want to hold it with your hand. 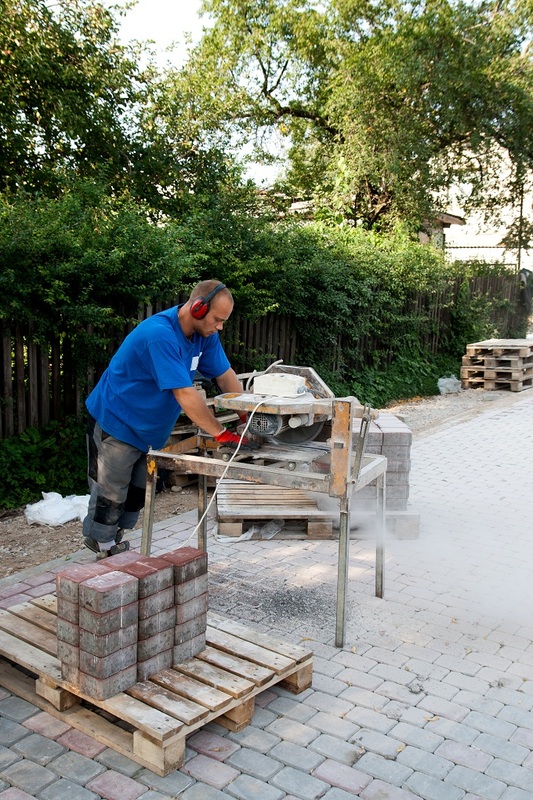 Tile, cement and brick are also cut with an abrasive process, although the blades used for these materials are different than those used for ferrous metals. 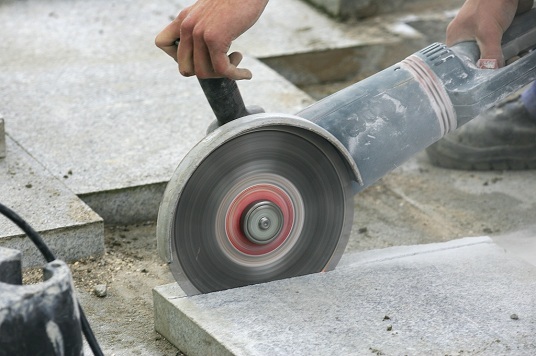 Never try and use a ferrous metal blade for cutting tile, concrete or brick, as these materials will grind the abrasive off of a metal cutting blade. These circular saw blades are also made for cutting masonry, cement, granite, stone, porcelain, ceramics, tile, marble, roof decking, fiber cement, cinder block… Such blades might have an occasional gullet on the blade, although there are no actual teeth. As with other types of circular saw blades, this gullet exists to remove waste material from the piece being cut. Although looking like teeth and possibly even having a hardened tip at the resumption of the blade after the slot, it is actually the abrasive which does the cutting. Fiber cement saw blade can have 4 to 8 teeth; upper limit is reserved for 10″ blades or larger diameters. Low tooth-count reflects on improved performance and much higher cutting speed. The size range starts from 3, 4-1/2″ up to 12″ or more. The tooth tips are reinforced with solid steel, coatings, tiny diamonds or silicon carbide grains, so the blade won’t get dull easily when passing through masonry, concrete or brick. 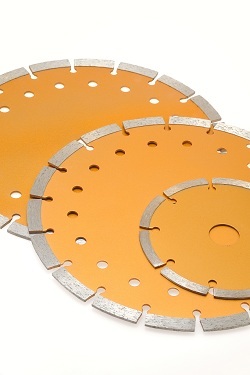 Diamond-tipped circular saw blades for masonry cut quickly, lasts longer and consume less power. Saw blade runs at 14k to 20k RPM which is twice the speed of a woodcutting blade. Setting circular saw to high speed with proper saw blade is the only way to cut porcelain or ceramic tiles without cracking them. Diamond knockout arbor is often seen on abrasive blades as they can be used for worm drive saws. When cutting these types of materials, it is essential that the saw blade is cooled by a water jet. This jet also serves to help clear waste materials out of the cut. Of all the materials that can be cut with a circular saw, these generate the most heat, with a high potential of destroying saw blades. Special saws are used, which have the capability of providing the water jet and have sealed motors which will not be damaged by the water. Glass is also cut with an abrasive process, similar to cutting ceramic tile. The major difference between glass cutting blades and abrasive blades used for cutting other materials is that the grit on glass blades is smaller. Since glass is highly susceptible to chipping and breaking, this smaller grit helps protect the glass. Cutting glass with any sort of abrasive blade is more a process of breaking off small chips than one of cutting. While this difference is small, it is important. A saw blade which is designed for cutting wood is sharp, allowing it to cut through the wood fibers. However, materials like tile and glass have no fibers. Therefore, it is necessary to chip away at the material. Because of the highly fragile nature of glass, it should always be cut extremely slowly. Cutting rapidly greatly increases the possibility of breaking the material you are trying to cut.